Since its launch two years ago, Guild Wars 2 has been using the same interface for its Trading Post. It worked, but good God was it clunky as hell to use, especially when you were trying to buy lots of different stuff at once. Thankfully, an upcoming patch will give the Trading Post a much-needed makeover. Perhaps most importantly, searching for items will be made a lot easier thanks to the new filtering system, which you can see on the top image. Since you can now filter for profession and stats, you won't have to wade through page upon page of different armor sets when you're only looking for that one level 11 Elementalist DPS chest armor. The profession filter applies to weapons, too, so if you're browsing Elementalist weapons, you won't have to skim over two-handed swords and axes as you do so—instead, you'll only be shown staves, scepters, daggers, foci, and tridents. The Trading Post's selling interface will be improved as well with the removal of the sort-by-name feature, so items will appear on the Sell Items page in the exact order they are in your inventory. The page will also ignore items in invisible bags, so you can't accidentally sell any of the stuff in your special bags, and the listing and exchange fees are also explicitly shown for each item. The trading post's slow-to-navigate tabs are also gone, replaced with a menu system similar to the Gem Store's. The Pick-Up tab is also getting replaced with the Delivery Box, visible above on the bottom left. This box can be seen on every Trading Post page, and it shows whether you have money or items to pick up (and, obviously, lets you pick them up if you're near a Black Lion Trader). 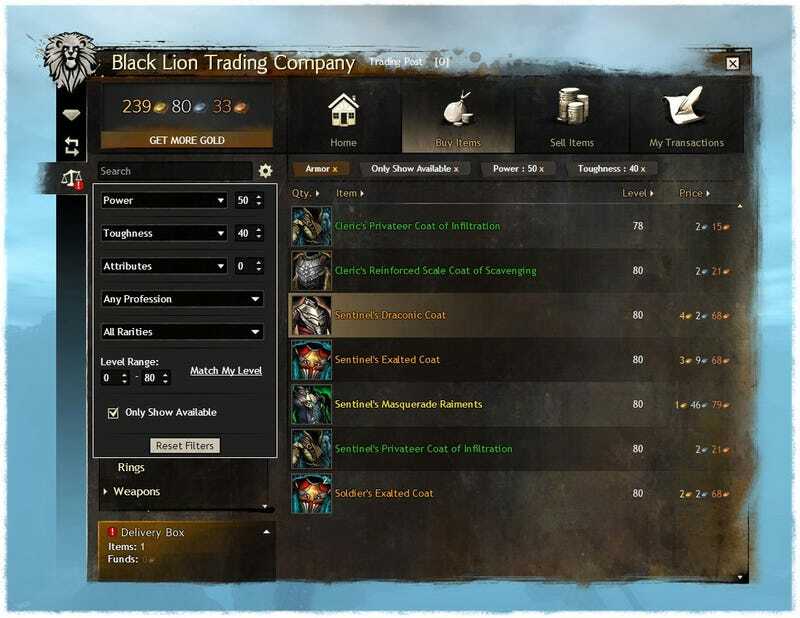 On top of all that, the Trading Post will be powered by a faster in-game browser that can load everything more quickly by relying more on the resources already available in the Guild Wars 2 client. The result is a Trading Post that no longer "slows down to think about" an item you are trying to look at. The improved Trading Post will be part of the September 2014 Feature Pack, which will be released next Tuesday, on September 9.